The QuoteSoft Piping program uses specific fonts to show fractions (¼, ½, ¾). If you have a workstation unable to view these fonts please click the link below, save the file, open the ZIP file and run the installer. After clicking the above link choose to run or open the file. Once the download is completed the ZIP file will open. Double click to run the Piping_Fonts.exe installer. **UPDATED – Added to the latest version of the Express Piping system (v. 2.5R8) is an option to disable the font fractions. Instead of using the symbol for ¼ the report will show 1/4. 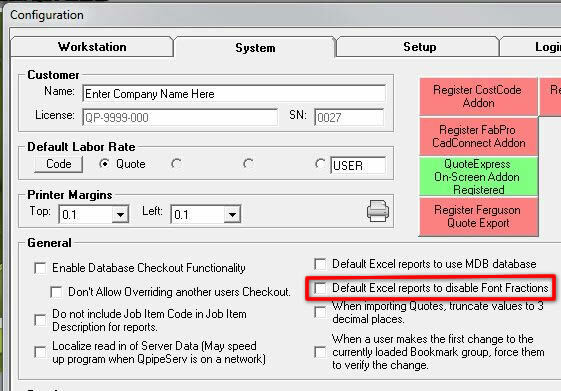 Upon running your excel report check the box to disable the fonts and your report will show simple fractions. See image below. If you would like to set this option as the default, return to the MainMenu and open Configuration. Go to the System Tab and check the box that will default the export to simple fractions. See image below. How do I get PHCC Labor into QuoteSoft? There are two ways of getting the PHCC labor values in QuoteSoft! Purchase directly from PHCC web store. PHCC has partnered with Harrison Publishing House’s CINX platform to provide a comprehensive plumbing and piping database for accurate, in-depth material pricing to create your own pricing workbook. Please notify QuoteSoft support at 458-207-0551 after purchase and we will unlock and train you on the PHCC labor! If you have any issues or questions feel free to call Technical Support at 541-684-4665 for assistance.